RC and I got together on the Friday at the Albert Park Hotel (warning: the website is a travesty of online decency) to beat the heat and take down DA. 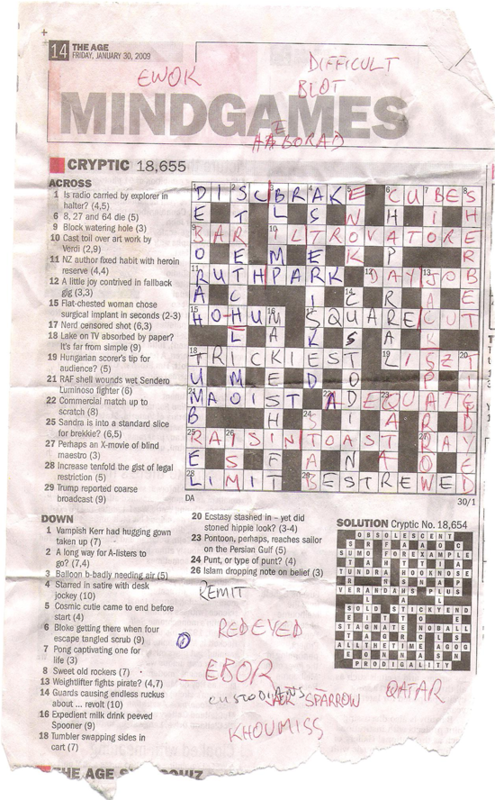 What we found, though, was that DA had defeated us, and we ended up spending a long while staring at the crossword with nothing to offer after a promising start. AS to RC: Is there some kind of shot that is a herman cut? RC to AS: Maybe. As in Pee Wee Herman, right? AS to RC: Actually, a french cut is a shot in cricket. RC to AS: The answer is square cut! Gold! Come Saturday afternoon, though, I just wanted to get the answers to the rest, and what I discovered was a fine crossword, even if I’ve got a helluva lot of confusion that I need resolving.